Amazing, enriching experience on so many levels. I have 13 teachers here. 4 professors. 9 classmates. Enjoyed the stay and the quiet, peaceful math environment ! This has been the best experience studying mathematics. Before, I didn’t really care that much about math, but the approach to mathematics here has made me completely fascinated by mathematics ! And the students here have been the best ! Yay math ! The courses here challenged me in the best way possible. 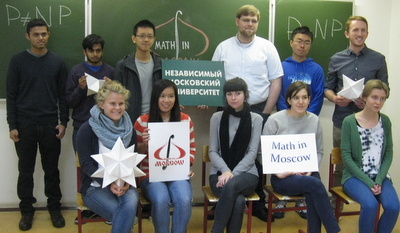 I learned so much, not only about math but also about life experiences and also Russian language & culture. I’m excited to be coming back to Moscow next year ! The courses here are very cool, but I don’t think that’s the strongest point (even though it’s very strong). The people here care about the students a lot, and they can help you develop in ways others can’t. Amazing experience. I’ve done a lot of math before this program, but in this program I feel as though I’ve finally learned to think as a mathematician. I feel like the lessons I learned here will insure me for the rest of my career. I’m not much for words, but this semester has been fantastic, and I’d highly recommend it to anyone who wants to come.